Keeping calm by teaching art. Most art teachers across the nation are certified K-12 and therefore see the entire variety in different paints. After my last painting class working with kids and having a great discussion with a friend who takes an oil painting class (who paints for a hobby) about her personal preference – the differences between paints were in my head and some people working with paint as beginners don’t realize the differences between some of the main paints used in the fine arts…even I’m still learning. So both as a reference for myself and anyone else who (God help you) stumbles upon my “blog” (if you can call it that), I figured it might be time to pull all the available information into one spot rather than scattering it across forums and company websites looking for a profit. There are many types of painting mediums but the four most common are Tempera, Acrylic, Watercolor and Oil. Within these types are more types so I gather that those learning as they go gather confusion right about here…let’s start with the two most commonly seen paints within the education world, Tempera and Acrylic. Tempera Paint is old in concept, in fact variations of Tempera Paint date back to Prehistoric eras. Artists would take pigment and mix it into egg yolks for a vibrant color. I can recall high school videos that showed just this. The basics show that egg based tempera paint is water, yolk, and pigment. This would be called “egg-based tempera“. This is still made but you won’t find it often in the school setting. Modern science, you might say, has taken tempera to more school-friendly level by taking out the “eggs” and making it a “water-based tempera“. That is why you can find tempera blocks and dry tempera that you can mix up at a later time to save materials and money. Most classrooms that are 8th grade and below stick to tempera paint because it is easy to use, usually washable, fast drying, inexpensive and if you’re smart, you’ll find the brands that carry quality colors. 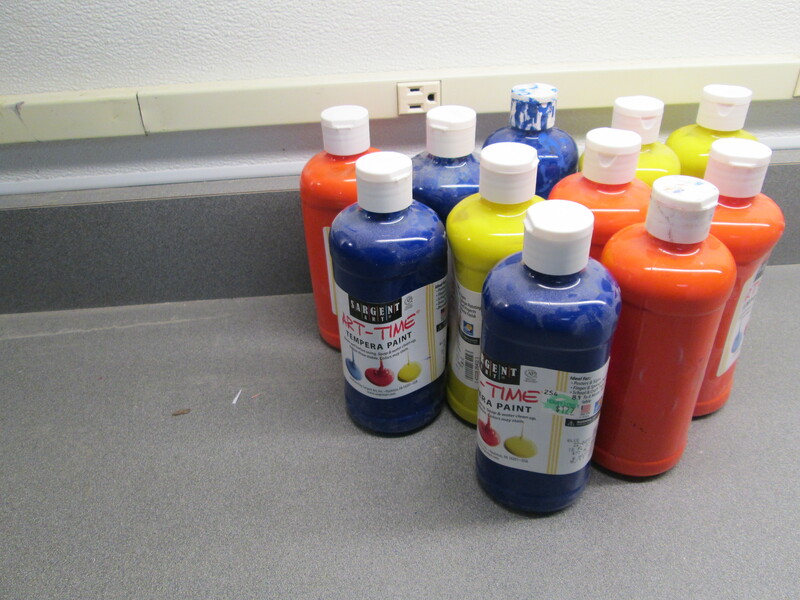 I haven’t been in one art room under 8th grade that doesn’t have at least one tray of tempera paint. Clean up is a cinch – just use water and if you don’t get it all, you can always re-rinse! Acrylic Paint is another modern change from the egg-based tempera in the sense that it is formed of pigment and made of synthetic polymers. It is often referred to as the “plastics of paint” because it has a very plastic, permanent, and workable consistency. This paint is used often for canvas work and can be found in an abundance of different quantities. You will see this paint at the high school level and occasionally at the middle school level depending on the projects. In my opinion, it can dry fairly quick but not as quick as tempera. 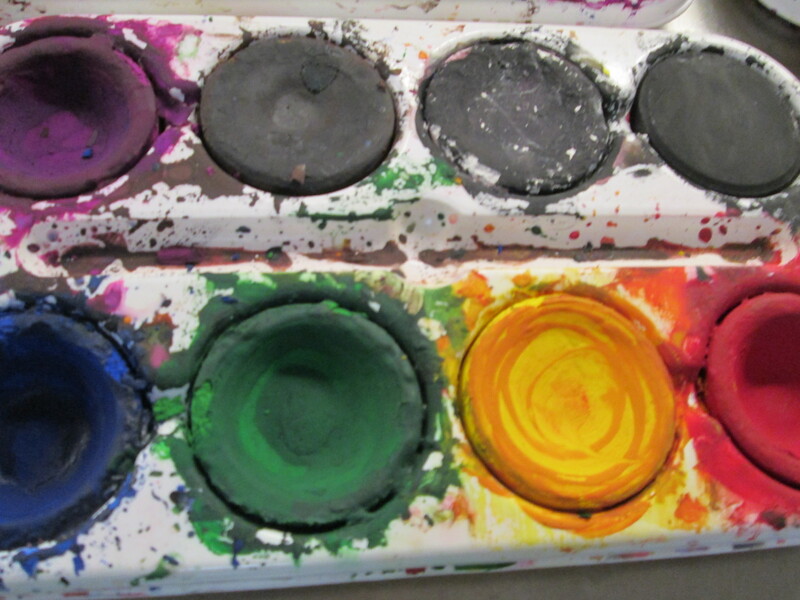 It is, however, permanent so there is no wash out – any art teacher can list the good and bad of washable paint. Acrylic is good for projects that will be displayed for lengths of time or for artists who want their artwork to dry within the time they finish it. The colors in acrylic paint tend to dry just a smidge darker than when its’ in wet form but as far as we can tell, they do not loose their pigment over time like other paint – then again, acrylic paint is fairly new to our world and thus it’s hard to tell. Colors also mix better than tempera but only because it doesn’t dry as fast. If you spend too much time mixing, acrylic paint, too, will dry. It’s vibrant color and permanence is great but can be frustrating for students and artists who leave and come back to their work later – it can not be re-wet like tempera paint. Clean up is easy – use water but make sure you clean thoroughly, this paint is permanent! Oil Paint is beyond both tempera and acrylic. There are reasons it is comparable and other reasons why some consider it to be a world all its’ own. You can probably guess the base of oil paint is well, oil. That is why so many people flock to the use of oil paint. It is workable, vibrant, and can stay moist for days, weeks, and in some situations, longer – it all depends on the environment you work in. For the slow working artist, this is ideal. For students, this can be a great learning experience but is not always the best in the K-12 setting due to the time constraints, storage constraints, and deadlines. In college, you see the use of oil paint increase. Oil also involves a lot of fumes so it’s a safe bet having windows around or a ventilation system will help you out. Oil paint is unfortunately more expensive for all these reasons and more but like liquid watercolor, a little bit goes a very long way. Color mix easily because the paint is rarely dry, and oil paint can be easily textures to add detail. 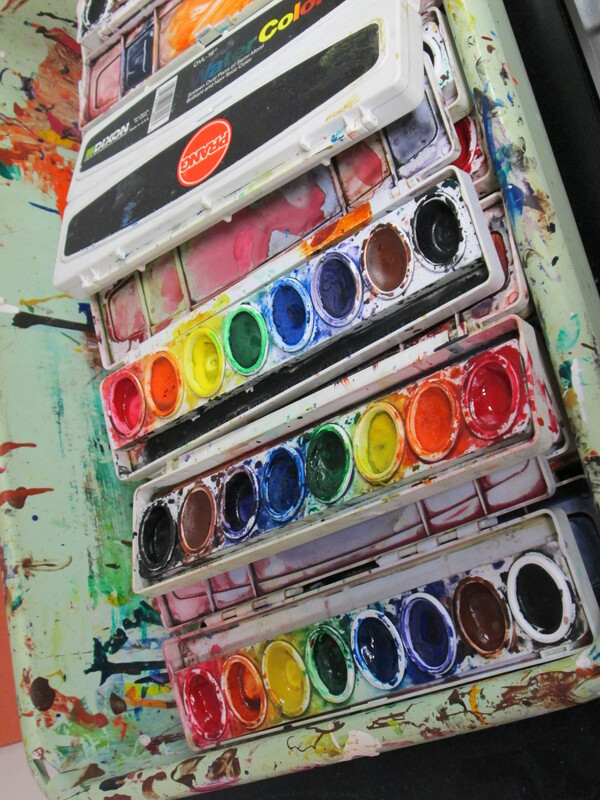 I will add a word of caution – oil paints are messy and they sure make great stains so be sure to have your turpentine ready to clean your brushes because water won’t cut it. My mess of Dry Watercolor Paints. Watercolor is also a paint some might consider a world of its’ own. This is because watercolor is found in multiple forms, both dry and wet and can be used in hundreds of different ways. Watercolor is easily enhanced, manipulated, or changed by other elements. There is dry watercolor, like you might see from crayola in palette form, and there is wet watercolor, that you would find in tubes similar to oil paint. Both go a very long way, it just depends on how you like to work. Wet Watercolor tends to be more advanced because understanding how a very little amount can be used in an extensive way comes with practice and patience. That said, dry watercolor tends to be more inexpensive that wet watercolor. This causes a large range of prices to be found and it’s a matter of personal preference when picking what you enjoy using. I will always recommend that when working with watercolor, no matter the age level, using watercolor paper is essential. Using watercolors on craft paper can be fun and in crafty instances, doable. But when working on projects, watercolor paper tends to stay more flat, be more workable and last longer. This paint is a medium on its own and depending on the project, can be used at any age level. Because it is water-based, clean up is simple. Some often compare watercolor to tempera because of their similarities with dry time and workability. Now that is not everything there is to know about these paints but it is a good start for people who are clueless. I know many art teachers who stick to what they grew up on/used in college and that’s fine! Whatever suites your fancy. I try to expose my students to tempera, acrylic, and watercolor. If I had older students, I would expose them to oil paint too. I stray from acrylic a lot because over time it can become stinky but that’s just my preference and my nose. I will soon be doing an article on paint brushes and project paper to help others make decisions too. Since I don’t know everything – what can I add to this nonsense that inform even further? What am I forgetting, leaving out or unaware of that is important for use crazy art people to know? Have at me, because I’m open! ← Art Class with … LMH? I’m engaged! Steve, this blog has plenty of projects throughout it. Consider looking through my menu options. And she lives! @ArtclasswithLMJ is back! Copyright, 2018. “ArtClasswithLMJ” was created and maintained by Lisa M. Hesse. Lisa M. Hesse maintains rights to all original documents and photography. If you desire to use any original information found on this website, please cite “ArtClasswithLMJ” in accordance with Federal Copyright Laws.